Even though cryptocurrency and blockchain now are well known to the public, there are still millions of questions about how to use it. So, how can you actually possess a bitcoin or any other digital money? Let’s focus on one of the most important cryptocurrency part — a wallet. This one is tricky, it may seem quite understandable from the first glance — a wallet where you store your digital coins! — But it is not as simple as it looks. The biggest difference from the traditional electronic wallet is that cryptocurrency wallet does not store your money in one place, it provides you with the access to your public keys and private keys and transaction records on different blockchains. Everything related to crypto is happening on the blockchain: for example, when somebody is sending you a cryptocurrency, the person simply signs off the ownership to your wallet address. A new block appears in the blockchain, gets confirmations, and your wallet shows your new balance. Public & Private keys — What is it? A transaction is a process which includes encryption using a pair of keys. Simply put: a public key is used for encryption, a private key — for decryption. All wallets have private keys stored in their files. Keys has strong mathematical relations with Bitcoin addresses and are generated by wallets. Anyone who has private key has control over funds. Some wallets can own your private keys but they can’t have access to use them. Using wallet software you get access to your private and public keys so that you can monitor your balance, send money, and make other operations. Wallet software can use the specific seed for generating private keys from a single value. 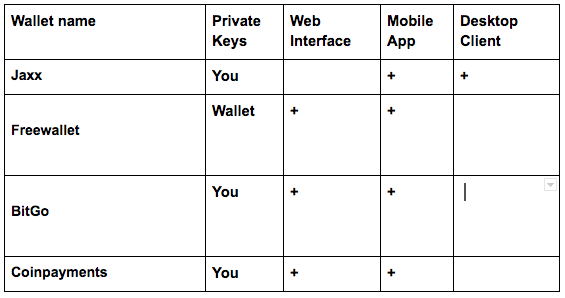 Wallets using this type of private keys generating are called the hierarchical deterministic wallet, or HD wallet. The seed value should not be confused with the private keys used directly to sign Bitcoin transactions. Don’t confuse seed value with the private keys, seed values are not used to sign Bitcoin transactions. HD wallets need to be backed up only once, usually using a mnemonic phase of 12 words. Using this phrase you will be able to restore the same private keys. Other wallets generate new private keys for each new address. In case such wallet file is damaged — you won’t be able to restore anything so that your funds will be lost. All right, but aren’t all these wallets same? Depending on your preferences, you can choose the way to store your digital money. 1. Software — it can be a site or an application for your PC or smartphone. 2. Hardware — devices to store your currency, can look like USB-drives. Most of those you got to purchase before use. 3. Paper wallet — a paper document including all the information for creating any number of private keys. Also, a paper wallet is usually mentioned as an offline key storage as a physical document. Do I need a wallet for each cryptocurrency? Some wallets support several cryptocurrencies, some are made exclusively for one currency. Let’s look at the most popular Ethereum, Bitcoin mono wallets. Now here’s a short list of multicurrency wallets where you can keep different coins. 1. Keep the majority of your funds offline, use smaller amounts in your daily use. Backup your wallets! 2. Use as more authentication steps as possible. You may also use multi-signature wallets which require permission from another person before the transaction (e.g. your spouse). 3. Update your wallet and device software. New software versions make sure that you have up to date security. 4. Keep your private keys safe. It doesn’t matter for Changelly which wallet you use to make an exchange, we only care if you feel safe with the one (or more) you choose!